© 2016 Marvel Studios / Walt Disney Pictures. All Rights Reserved. Captain America: Civil War was released in the US last week. I bypassed opening weekend and opted to catch the film on Monday afternoon because responsible adults skip work to see superhero movies…right? Since its opening oversees, I had made a pointed effort to avoid spoilers…not an easy task when you have the internet at your beck and call and friends who have seen it. I made notes afterwards but can't find them so I'm going with strictly my memory! Warning, this may contain minor spoilers. The previous Captain America film has been my favorite in the Marvel Cinematic Universe (MCU), thus far, so I was a little apprehensive about Captain America: Civil War. With all of the hype surrounding it, I prepared myself for any disappointment I might feel as that's generally what happens when things I really like are so talked up. First things first, there's a lot going on in this movie and to be honest, it needs another viewing to properly process everything that's happening…but, here's my take. We all know the basic plot of story. The Avengers have protected our world from various evils but in doing so, innocent lives have been lost. In the first Avengers, New York City was wrecked. In Captain America: Winter Soldier, Washington, DC was wrecked. In The Avengers: Age of Ultron, the fictional Sokovia was wrecked. And now in Captain America: Civil War, Lagos, Nigeria falls victim. As a result of all of this destruction and loss of life the governments of the world want to regulate superheros under an accord. Let us be honest. In real life, we wouldn't want a legion of super-powered beings running around "saving" the world vigilante style. Hell, I'm not even sure I'd want it with regulation, no, I know I wouldn't want it. It's all a rather frightening concept when you think about it. As for the regulations, the Sokovia Accords, what about all of the other superheros working on the Earth? How do the regulations affect them? Is there a sign-up sheet? Forms to fill out? Are their fines imposed or are they automatically criminals if they don't sign? One would think Captain America/Steve Rogers (Chris Evans) would be all for the government regulations being the good soldier man that he is. But Rogers has become disillusioned plus the added factor of sticking with his oldest friend, Bucky Barnes/Winter Soldier (Sebastian Stan). He's suffering from guilt and loss and in typical Cap style, he's unwavering in his stance. He doesn't want to be regulated by authority. He feels they are capable self-regulation, that they don't need someone telling them when and where they should help people. On the opposite side, we have Iron Man/Tony Stark (Robert Downey Jr.) who you would expect to disagree with the accord. Stark in the past has been arrogant and reckless. But, guilt (coming face to face with the mother of someone who was "collateral damage" in one of the battles) and loss have made him be more conscience. His logic makes perfect sense, you can't really realistically argue with with his line of reasoning. Lines are drawn and sides are picked. 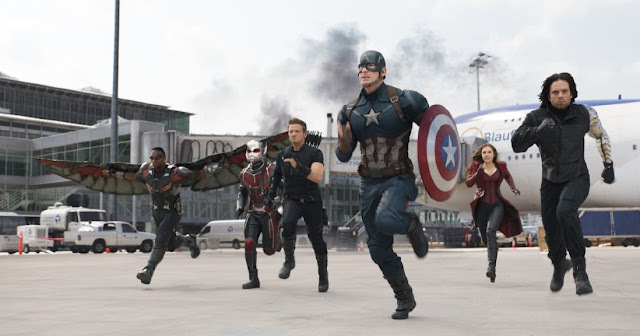 Rolling with Cap is Bucky (they're basically a ride or die relationship as far as Cap is concerned), Falcon/Sam Wilson (Anthony Mackie) who seems to be first runner up in the ride or die with Cap thing, Scarlet Witch/Wanda Maximoff (Elizabeth Olsen), Hawkeye/Clint Barton (Jeremy Renner), Ant-Man/Scott Lang (Paul Rudd) and Sharon Carter (Emily VanCamp) who job wise is with the authorities but slides Cap info and a smooch. Rolling with Iron Man is Rhodey/War Machine (Don Cheadle) who is taken down by friendly fire, Vision (Paul Battany), Black Widow/Natasha Romanoff (Scarlett Johansson) who works both sides, Spider-Man/Peter Parker (Tom Holland) whom Stark apparently found trolling the internet (?) and by default Black Panther/T'Challa (Chadwick Boseman) who wants justice/vengeance for his father. Both Evans and Downey Jr. give stellar performances. The latter particularly so. I'll be honest, this is possibly the first time I've not wanted to give Tony Stark a smack at some point. This time out, Downey Jr. made me feel Stark's feelings…his guilt, sadness and betrayal as if it were my own. I found myself by the end, wanting to give him a hug. Evans in the previous two Captain America movies made me like Cap…he (the scripts and direction) made what I've always considered a vanilla bore, a relatable interesting character; he is Cap in my mind now and I'd be tempted to address him as such if I ran into him on the street. Steve Rogers loyalty to his friend Bucky is intense. There's a point where they joke about a girl they used to know and Bucky declares she must be about a hundred years old now and Steve says 'so are we' as they laugh. This brings home why this friendship means so much, why he's fighting so hard for it especially having just lost the only other person from his past. The much talked about airport scene was visually epic but, in my opinion, was a little too long. It did however give a platform for Spider-Man, Ant-Man (go big or go home) and to a lesser extent Black Panther to be showcased. I'm still not a Spider-Man fan but I think I might like this latest incarnation better than any of the previous. There was something relatable and fun about him fanboy'ing while in the mist of a battle. There was a villain, Zemo (Daniel Brühl). He is set up nicely for something down the line should he be needed. But, for this film, I felt he was lacking. I would like to see more of the friendship between Scarlet Witch and Vision. They're both learning who they are and what they can do. I thought they had nice chemistry. They are connected. Both end up going through similar trauma as a result of how they used their power. The one thing I did have a problem with was her being so much stronger than him. Yes, her powers come from the same stone that powers him but one would think the one who has the stone within him would be the stronger one but she laid him out. I didn't really see a good point in having Hawkeye come out of retirement for this. Yes, he was tasked with getting through to Wanda but was he really needed for that? It felt like he was was wasted in this. I enjoy the character as much as the next person but I just wasn't feeling his presence. I guess he had to be put into position for what's to come. Though I get why they were there, I think Ant-man and Spider-Man could have been left out too. I especially get the whole Spider-Man inclusion thing; they needed to set up his upcoming foray into the MCU. It would have been more fun though to not have told us he was going to be there and let us be surprised though with the internet, how long would it have stayed a surprise? I think everyone wants to go on a road-trip with Bucky and Falcon…preferably in the Beetle Bug with Cap driving. At some point he'd have to say 'don't make me pull this car over!' The relationship between Bucky and Falcon is one of both trust (they both trust Cap so they reluctantly trust each other) and distrust (Bucky did try to kill them last movie) with a smidge of insecurity and jealousy sprinkled in. One thing I don't get though. When and where did Cap learn about Tony Starks parents? Am I forgetting something from a previous movie? Did I miss something in this one? There just seemed to be a missing piece. Oh hold up, he learned when he and Widow were on honeymoon in New Jersey inside the brain…son of a gun, can't believe I forgot that until re-watching Winter Soldier again. The standout performance for me came from Boseman. I wanted more of his Black Panther but that will come in due time. Black Panther spent the majority of the film with a single minded determination, very similar to Cap in determination when you think about it. Plus he was just all kinds of badass. In the end, no one won. We lost Captain America. What we re-gain is Steve Rogers, the guy from Brooklyn full of heart and courage, standing up for what he believes in…yeah, we've come full circle. After all was said and done…after willing to go to the end for his Bucky, betraying another friend for him, becoming a renegade, Cap still had to let him go. Yes, he's still alive but at what cost. From the first moment he hit the screen, I wanted to give Bucky a hug and at the end, I felt the same way and was a little saddened that Cap couldn't even spare a bro hug for his friend. I know a lot of people missed the presence of the Hulk and Thor. I however didn't miss them; there were more than enough characters involved. I can't think of one scene that would have benefitted from them being there. Captain America: Civil War is a really good movie; I enjoyed it a lot. I think I still might prefer Winter Solder but that may simply be because I've had time to dissect it, pick up all the little bits and bobs that comes from seeing something more than once.